This adds back in the censored material removed from the theatrical release. Massive Thanks to Elbarto1 as without his help this edit would probably never of been finished. Added 6 of 7 deleted scenes back to movie. Not the hardest job in the world compared to other edits i have made, the deleted scenes were not in great nick and some of them were missing BGM and ambient FX which have been rebuilt, as usual i have done my best and they do look considerably cleaner than the raw scenes displayed on the original DVD. - Tyler quits smoking / Jack quits work – two little bookends to the scene where Jack quits his job; helps to explain jacks motives for doing so. 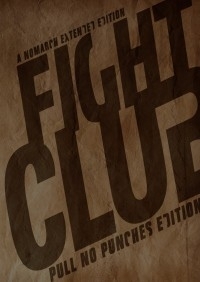 Fight Club Pull No Punches presents a few brief/nice moments left on the cutting room floor. They do not in any way alter the tone, feeling, or meaning of the film. The fact that they change nothing does reinforce the fact that it was OK to cut them, but also, they are so brief that the amount of time saved seems trivial to me and I wish that they had left them in. The edits themselves are seamlessly integrated from an editing standpoint and Nomarch has done what can be done to salvage the audio. The deleted scenes themselves are very poor quality, this is of course not the editor’s fault, he has done the best he can with the material available, and as Extended Editions go, this is one of the factors that must be accepted now and again. As Dwight pointed out however, the edit is very dark overall, even when compared to the original. The shadows are far heavier and there is a loss of detail/fidelity. When you combine the darkness issue with the poor quality of the deleted scenes and then finally the fact that these scenes add little value to the story ultimately make this a 7/10 for me. It is a curious 1-time watch, but next time I get a hunkering for Fight Club, I’ll be watching the theatrical. The deleted scenes neither make nor break the movie, but in any case I liked watching this version. Too bad about the technical quality of the scenes themselves, but there’s not much a faneditor can make about that. What’s a pity, however, is that the whole movie looks too dark and murky, as a result of what appears to be a fairly common DVD export settings error that can be, and should have been, avoided. I would have rated it higher with the proper settings (it must be said that, otherwise, video and audio is fine), as it is I give it 7/10.